The following is a discussion of the various types of stainless steel. 304: The basic alloy. Type 304 is an austenitic steel possessing a minimum of 18% chromium and 8% nickel, combined with a maximum of 0.08% carbon. It is a nonmagnetic steel which cannot be hardened by heat treatment, but instead. must be cold worked to obtain higher tensile strengths. The 18% minimum chromium content provides corrosion and oxidation resistance. The alloy's metallurgical characteristics are established primarily by the nickel content (8% mm. ), which also extends resistance to corrosion caused by reducing chemicals. Carbon, a necessity of mixed benefit, is held at a level (0.08% max.) that is satisfactory for most service applications. The stainless alloy resists most oxidizing acids and can withstand all ordinary rusting. HOWEVER, IT WILL TARNISH. It is immune to foodstuffs, sterilizing solutions, most of the organic chemicals and dyestuffs, and a wide variety of inorganic chemicals. Type 304, or one of its modifications, is the material specified more than 50% of the time whenever a stainless steel is used. 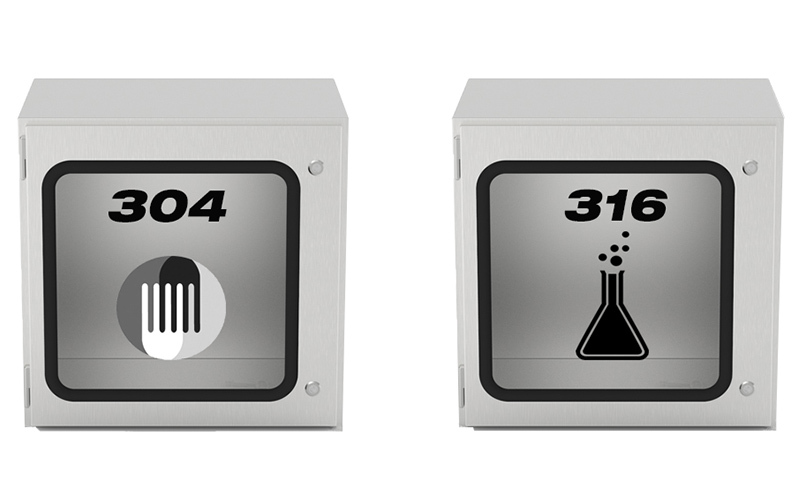 Because of its ability to withstand the corrosive action of various acids found in fruits, meats, milk, and vegetables, Type 304 is used for sinks, tabletops, coffee urns, stoves, refrigerators, milk and cream dispensers, and steam tables. It is also used in numerous other utensils such as cooking appliances, pots, pans, and flatware. Type 304 is especially suited for all types of dairy equipment - milking machines, containers, homogenizers, sterilizers, and storage and hauling tanks, including piping, valves, milk trucks and railroad cars. This 18-8 alloy is equally serviceable in the brewing industry where it is used in pipelines, yeast pans, fermentation vats, storage and railway cars, etc. The citrus and fruit juice industry also uses Type 304 for all their handling, crushing, preparation, storage and hauling equipment. In those food processing applications such as in mills, bakeries, and slaughter and packing houses, all metal equipment exposed to animal and vegetable oils, fats, and acids is manufactured from Type 304. Type 304 is also used for the dye tanks, pipelines buckets, dippers, etc. that come in contact with the lormic, acetic, and other organic acids used in the dyeing industry. In the marine environment, because of it slightly higher strength and wear resistance than type 316 it is also used for nuts, bolts, screws, and other fasteners. It is also used for springs, cogs, and other components where both wear and corrosion resistance is needed. 316: For severe environments. Of course, there are many industrial processes that require a higher level of resistance to corrosion than Type 304 can offer. For these applications, Type 316 is the answer. By virtue of the molybdenum addition, Type 316 can withstand corrosive attack by sodium and calcium brines, hypochlorite solutions, phosphoric acid; and the sulfite liquors and sulfurous acids used in the paper pulp industry. This alloy, therefore, is specified for industrial equipment that handles the corrosive process chemicals used to produce inks, rayons, photographic chemicals, paper, textiles, bleaches, and rubber. Type 316 is also used extensively for surgical implants within the hostile environment of the body. 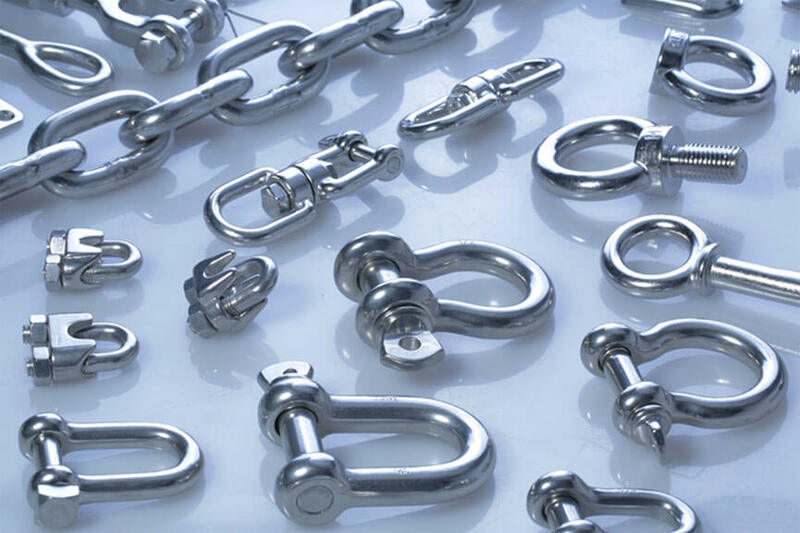 Type 316 is the main stainless used in the marine environment, with the exception of fasteners and other items where strength and wear resistance are needed, then Type 304 is typically used.